The Basics of Building a Healthy Plate – Christenson Transportation, Inc.
With all of the health-related information available these days, it’s sometimes difficult to know what foods to choose for meals and snacks. Good news: choosing and eating healthy meals and snacks doesn’t have to be difficult or expensive, and it can still taste good. One definition of the word “healthy” is indicative of, conducive to, or promoting good health. By that definition, there are a few simple points to keep in mind that can assist you in building a healthy plate without much fuss. Many people probably remember the Food Pyramid or the many other versions of it that have existed over the years. The goal of these guides is to promote eating in a varied and balanced way. Variety refers to a bunch of different kinds of foods and is necessary for optimal intake of nutrients. Balance refers to eating these foods in proportions that are most beneficial to the body. 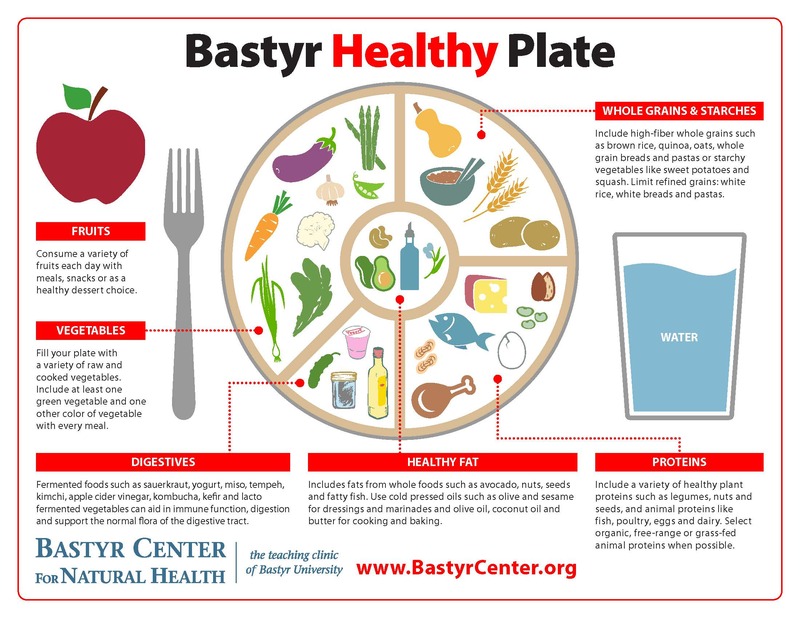 The latest guide to healthy eating is called MyPlate, and its goal is to provide a visual representation of what variety and balance would look like at each meal. Below is an adapted version of the USDA’s MyPlate. This version divides a typical dinner plate into five sections: Whole Grains & Starches, Proteins, Healthy Fats, Digestives, Vegetables, and Fruits. Image from Bastyr Center for Natural Health. Click HERE to view an enlarged version. Whole Grains & Starches: Include high-fiber whole grains such as brown rice, quinoa, oats, whole grain breads and pastas, or starchy vegetables like sweet potatoes, corn, and peas. Whole grains and starches make up about 1/4 of a plate. Be mindful of refined grains (white bread, white rice, pasta), and consider choosing whole grains half of the time. Proteins: Include a variety of plant proteins such as beans, nuts, and seeds, as well as animal proteins like fish, poultry, eggs, and dairy. Proteins make up about 1/4 of a plate. Healthy Fats: Include fats from whole foods such as avocado, nuts, and seeds. Use cold-pressed oils such as olive oil and sesame oil for dressings and marinades; use olive oil, coconut oil, and butter for cooking and baking. Fats make up a small portion of a plate, about the size of a ping pong ball, and are often included in cooking, e.g. chicken roasted with some olive oil. Digestives (also known as probiotics): Fermented foods such as sauerkraut, yogurt, miso, tempeh, kimchi, apple cider vinegar, kombucha, kefir, and fermented vegetables can aid in immune function, digestion, and support the normal flora of the digestive tract. Stay tuned for an upcoming post outlining the details of these foods. Vegetables: Fill your plate with a variety of raw and cooked vegetables, making sure to choose different colors, e.g. dark green (broccoli, spinach), orange/red (tomatoes, bell peppers), purple (eggplant, red onion), white (cauliflower, onion, garlic), etc. Vegetables make up about 2/3 of a plate. Fruits: Consume a variety of fruits with meals, snacks, or as a refreshing dessert choice. Fruit makes up to 1/4 of a plate and sometimes shares space with vegetables. A couple more things: Water is included as the most healthful beverage to go along with meals (don’t forget the importance of staying hydrated! ), and 8-12 oz. per meal and snack is generally appropriate. Also, you may have noticed some information on the graphic about choosing organic, free-range, grass-fed products. If these are accessible to you and you desire to choose them, that’s great; if they’re not accessible to you, don’t worry, and don’t let it cause you stress. You’ll reap the benefits of a balanced and varied plate, regardless of whether or not you choose organic products. Below are some photos representing balanced meals with good variety. Salmon (protein + fat) with brown rice (whole grain) and mixed vegetables. Roast (protein + fat), potatoes and peas (starch), carrots and cabbage (vegetables). Note: the meat portion on this plate is extra large. Pizza: crust (grain), cheese (protein + fat), peppers/onions and sauce (vegetable). Note: thin crust pizza generally provides adequate grain component. Deli sandwich/wrap: bread/tortilla/pita (grain), ham/turkey (protein), lettuce and tomato (vegetable). Note: choose whole grain bread/tortilla/pita if available, pair with fruit or vegetable, and add mayonnaise, cheese, or chips for fat. Hamburger: bun (grain), hamburger patty (protein +fat), lettuce/onion/tomato (vegetable), cheese or mayonnaise (fat). Yogurt parfait: yogurt (protein + fat + digestive), granola (whole grain + fat), berries (fruit). Note: be mindful of sugar content in both yogurt and granola, and choose Greek yogurt for extra protein. Each day for lunch this week, I will eat an apple in addition to my regularly eaten peanut butter sandwich. When ordering a hamburger, I will order it with lettuce, tomato, and onion, and/or have a side salad with it. Next time I go grocery shopping, I’ll purchase two vegetables of different colors, e.g. broccoli and red peppers, to have with dinners a few times during the week. Instead of eating sugary cereal for breakfast, I’ll have some oatmeal with blueberries and Greek yogurt. Regardless of whether you plan meals and snacks ahead of time, regularly choose to eat out, or spontaneously put together several food items in hopes of it making a satisfactory meal, aiming for variety and balance as outlined above can go a long way in helping you to find better health if you desire it.